Shortly before Easter I heard a statistic that said 80% of the rabbits that end up in shelters and rescues were originally bought as Easter presents. 80%. Half of that seems unimaginable, 80% sounds obscene. And Easter happens every year. Rabbits start getting surrendered a few weeks after Easter, once the thrill of having an Easter bunny wears off and the reality of their care sets in. Last year, Carrie at All Things Dog Blog started the Rabbit Adoptathon Blog Hop as a way to educate people about rabbits and their care and to promote adoption. This year we have been the privilege of co-hosting the event Bunny’s Blog. It’s easy to get involved. 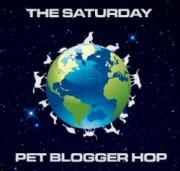 You can join in on your blog (you don’t have to be a bunny blogger to join in) or on Facebook. We will have a linky up beginning on Sunday, May 13th and all you have to do is share adoptable bunnies or information on rabbit care. There is a badge on my sidebar you can add to your blog, share on Facebook or use in a post. You can find the specifics on The Rabbit Adoptathon page. So please join us in the Rabbit Adoptathon and lets blitz the Internet with bunnies to help find some of these rabbits a new home. All Things Dog Blog is so pleased to see our event in memory of Robby live on. We look forward to seeing you all in May. That is obscene. I try to encourage people not to get ANY pet without researching and understanding what goes into having a pet. Fantastic idea! I’m getting to know the rabbits at our shelter now (there are at least 7) and we’re considering adopting one. @JodiStone I tend to think people spend more time researching what TV, cellphone or gaming system they want to get than they do a pet. I try to encourage them as well. @volunteers4paws How exciting! Rabbits make great pets. People always seem surprised to find out they have a personaility, but they do. Just ask Ms Glee the diva bunny. What a great idea! Thanks for spreading the word!